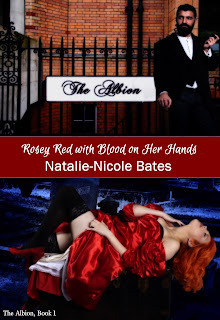 ROSEY RED WITH BLOOD ON HER HANDS is now available!! Rosey Rydall is a very entrepreneurial girl. Check-in girl at The Albion Hotel is only one of her jobs. In the background, she runs an informal body selling business with the town coroner, Anton Larsen. She also is a trusted friend and confidante of wealthy hotel mogul, Thaddeus Anderton. A friendship that is both loving and beneficial for Rosey. She haunts the dreams and existence of Marty Burke, a much married, decorated and respected police officer who looks the other way from Rosey’s business, as well as the night time activities occurring in the basement of The Albion. The other is her partner is crime, Doctor Anton Larsen, a man of true quality who loves the dark and dangerous as much as Rosey. When Marty’s wife dies, and he turns his attention to Rosey, she spurns his attempts at possessing her. In turn, he threatens everything and everyone Rosey loves. She must now take bold and decisive action to rid herself of Marty, or risk the lives of those who mean the most to her. A 5 Star TOP PICK Review for HIS REDEMPTION! !